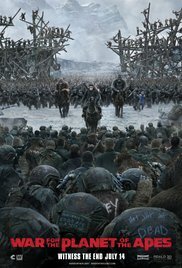 War for the Planet of the Apes is the third and final installment in this trilogy. I've read rumors somewhere for a fourth but for now, I will assume this is the final in the story. We follow the leader of the apes, Caesar, and his ape followers as they go up against humans in a war for humanity's survival. Cast: Andy Serkis, Woody Harrelson, Steve Sahn, Karin Konoval, Amiah Miller, Terry Notary, Michael Adamthwaite, Toby Kebbell, Gabriel Chavarria, Judy Greer, Sara Canning, Devyn Dalton and many others. Pros: What I liked about this movie is the same from what I enjoyed in the previous films: the special effects. The Apes looked so real and Andy Serkis is an amazing actor bringing a character like Caesar alive since the first movie. Not only did he master Gollum/Smeagol from Lord of the Rings, he has now mastered the leader of the apes as well. I liked how you side with the apes even if I myself am human, it just shows how the apes just want to live and how humans can be so evil and how it's easy to hate your own kind. The action was great and the emotional aspect and reasoning of this final chapter on how war drives us to madness was well done. Caesar has a hard time being peaceful with humans after an event but the girl you see in the trailers played by Amiah Miller shows him that not all are bad. He, of course, knows this since the first movie but after an event that transpires, his mind is clouded until she does a nice deed, it was pretty touching. Cons: The villain, played by Woody Harrelson, had an objective of eradicating all the apes but his plan to me was flawed. Rather than fighting and killing them he should have been putting other resources into something else he and his men were dealing with at the time, which I won't spoil. Also, War was probably not a good title for this movie, I say that because the movie had some scenes fighting between ape and humans but it was mostly just a build up of such fights. This was a good end to a trilogy and was very touching. If there is a fourth I guess I wouldn't really mind but if doesn't happen I'd be okay with that too. Try not to cry in the end, I had to hold back a tear or two.